The Plugable VGA to HDMI Active Adapter provides a link to the computers of yesteryear. 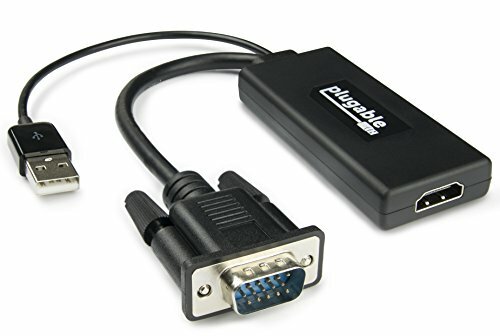 When older computers only provide a VGA output for displays, this adapter offers a means to connect those older machines to a more modern, HDMI capable monitor or television. Our adapter serves as a simple, active solution to connecting your older computers to newer displays. It also features audio transmission and supplies power through its attached USB 2.0 cable. Our VGAM-HDMIF adapter is compatible with host systems that provide VGA output and displays that support HDMI input. It is not a bi-directional cable, which means it can only work in one direction: from a VGA capable computer to a monitor or television that provides an HDMI input. This adapter is capable of a maximum resolution and refresh rate of 1920x1080@60Hz.